Our Strategic Consultancy Helps Startups and Expansion Stage Companies with Complex Sales Cycles Define 360° Demand Generation Strategies that Grow Revenues and Improve Margin Metrics. Make no mistake, the rise of social media and the evolution of smart mobile devices have changed the sales and marketing landscape for most companies. Customers now exchange feedback on their buying and service experiences with their friends, family and acquaintances on a more frequent basis. Additionally, more and more potential customers research products online before committing their cash to a purchase. ​In an era where digital influencers greatly sway overall buying patterns, service excellence and brand stewardship are more crucial than ever before. On both fronts, companies that have developed comprehensive Demand Generation strategies are finding that they have a substantial competitive advantage over their competitors that have remained on the sidelines. The key to their success is being in the right place at the right time with messaging that resonates with your customers' buying team members and ultimately builds brand advocacy. Many C-Level executives associate Demand Generation with technology solutions and/or tactical content programs. It's been our experience that organizations that avoid or ignore any of Demand Generation's four strategic pillars often doom their programs to failure. Consequently, our strategies often help clients shift their sales and marketing departments from antiquated product centered silos toward fully integrated operations that are customer focused. Beyond the organizational aspects, Our Demand Generation consultants help our clients design, implement and execute effective Demand Generation programs. We evaluate the current state of your lead generation, customer acquisition and customer retention / loyalty campaigns and identify improvement opportunities that improve your platform. In short, our business strategy consultants help your organization generate excitement in your products and services at every customer contact point. Using a metrics driven approach, our Demand Generation consultants incorporate proven contact strategies from a wide array of industries with highly complex sales cycles into our recommended solutions. Our firm's goal is to successfully guide your company’s sales prospects through the conversion process as quickly as possible and ensure that every marketing dollar you spend generates an exponential return on investment. The bottom line is we help our clients develop touch point programs that their strengthen their customer relationships and lead to greater sales figures. Our goal is to maximize your Customer Lifetime Value and optimize the blended ROI for your sales/marketing programs as a whole. Effective Demand Generation is a full organizational discipline that extends beyond content and technology. Our 2018 white paper examines the discipline from a strategic standpoint. We look at the critical factors which typically separate effective Demand Generation programs from their ineffective counterparts. We also address the foundations of an effective Demand Generation strategy and offer some tactical recommendations for each of the four strategic pillars. Chi Rho Consulting helps clients build content-rich demand generation strategies that build and nurture key prospect and relations for the long term. Our strategies help you make the most of your resource constraints, maximize long term revenues and protect your profit margin. We understand the tactical intricacies of the solutions we recommend, meaning that you won't have to spend a fortune to produce quality content. We connect you with leading influences and top-tier tactical services if outsourcing is required. It's a myth that demand generation activities can't be quantified. With demand generation, effectiveness correlates with revenue growth. Therefore, we devise game plans that gather all of the data available at every touch point within your revenue funnel so that you can predict future outcomes and refine your programs accordingly. We also help you define structured test and control sequences so you can explore new channels and tactics with minimized risk. Additionally, we help you optimize your analytics capabilities so you can deliver timely and efficient reporting and key findings to decision makers and your sales team. This allows you to stay ahead of your competitors and establish your organization as the expert solution in your line of business. Whether you're a startup or growth stage business, there are a number of affordable marketing automation solutions available that help you streamline your demand generation processes. We're familiar with them and we help you identify the best-fit solutions for your business model. We also assist you in forecasting your long-term technology requirements, which allows you avoid surprises and plan a phased approach to lessen the the impact on your forecast P&L. If necessary, we also manage the integration of automation solutions across your organization to lessen disruption and contain costs. 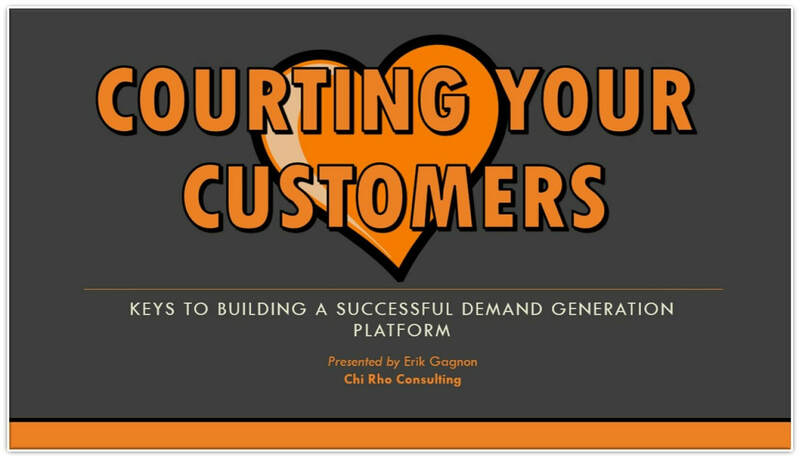 Courting Your Customers examines the foundations of a successful enterprise Demand Generation program. We examine the strategy behind your sales and marketing campaigns including the people, the process, the content and business analytics. Beyond digital content marketing, Demand Generation is a full business discipline. If you're an entrepreneur seeking to define your sales and marketing strategy, we provide an complete overview of the discipline. If you're already engaged in Demand Generation, we examine the key differences between effective and ineffective platforms. You'll walk away from this seminar with a solid understanding of what's required to build an integrated, best of class process that leverages your organization's strengths in a quick and cost-effective manner.